Without a doubt, tuesday is my toughest day of the week with my lovely eight lessons so before I go and check out my tons of french homework again I just wanted to wish you all a nice day and hope you all having a great time in school. See you soon! Thanks honey for visiting my blog! Following you back!! oh this so nice, very romantic look ! Love the crown of flowers - very beautiful! I love that flower headband! It makes the whole outfit seem so much more whimsical! Good luck with all your classes today! I definitely know what you're talking about - on Tuesdays I have classes from !0AM to 7PM. UGH! Love the floral head dress!!! YOU look soo LOVELY!!! Nice skirt :) Visit my blog and if you want we follow each other kisse from Perú. You look so gentle!!! COOL! 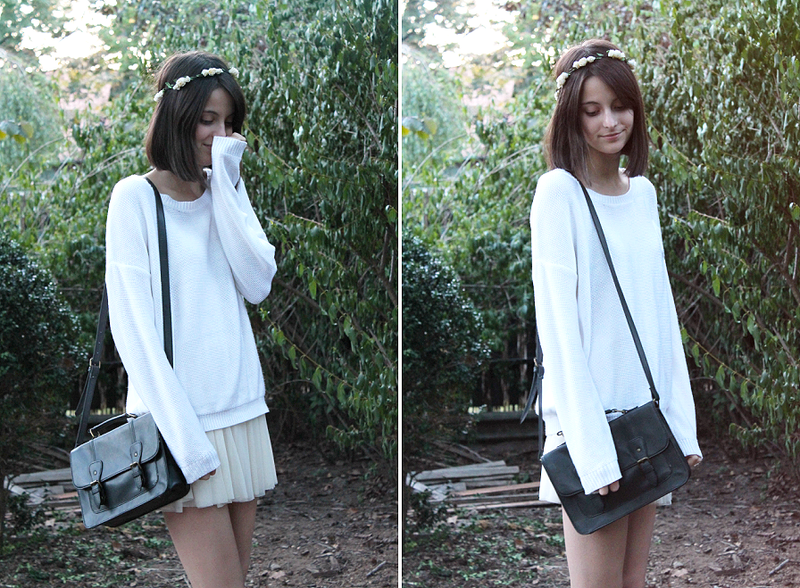 love the white sweater with the blush skirt! I follow, have an awesome day! You're looking cute! I really like the way you're dressing! I would love to follow eachother! Me encanta tu estilo y blog, échale un vistazo al mio! Your flower crown is so cute and delicate! I love it! !